Your web site profile details and Meta tag are two different things. Although both contains titles, keywords and descriptions, Your web site profile (see Entering Site Information for details) will be used for submission to Directory Engines such as Dmoz.org while the Meta Tag within your web pages will be used for Spider search engines, like Google, Altavista etc. 1. 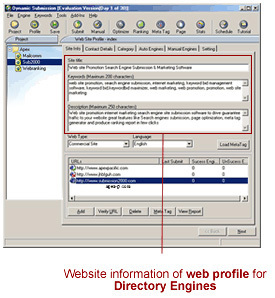 Web profile details (includes the Title, Keywords and Description information). Enter this information from the "Site Info" tab of the web Profile window. This information will be sent to the search engines by Dynamic Submission. 2. 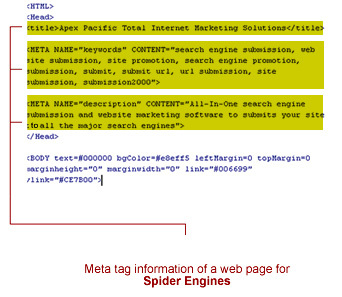 Meta Tag Details (includes the Title, Keywords and Description information) within your web pages will NOT be submitted by Dynamic Submission, these information will be retrieved from those web pages by the "Spider" type of search engines automatically.